Learn how an industry-leading provider of storage and data management solutions used Social Business Software to accelerate a global branding initiative and connect with thousands of community members across one hundred countries. 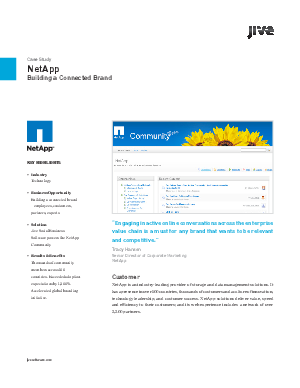 NetApp surveyed thousands of their customers, partners and technology experts. The majority of respondents stated that they wanted an interactive community to facilitate knowledge sharing around product, technology, and business concerns. Two years later, the NetApp Community is wildly successful at meeting these community goals, exceeding adoption and activity expectations by 1,200%. As a result, NetApp has engaged a much broader audience in both technical and business decisions, and expanded their brand awareness and loyalty.